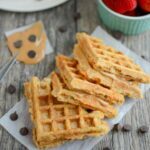 These Sweet Potato Waffles are kid-friendly and perfect for breakfast, pre-workout fuel or an afternoon snack. Add some peanut butter in the middle for a fun waffle sandwich! It’s been about 4 years since I shared this recipe for Sweet Potato Waffles with you! They’re still a favorite of mine, especially to turn into little waffle sandwiches because they’re just so darn cute and delicious. I don’t know what it is about this pregnancy but waffles have become one of go to foods – one of the few things I can almost always stomach. Regular waffles are fine, but I like the sweet potato twist that these have! This is a small batch recipe. The original recipe made just two waffles so I tweaked it a little bit and now it makes 4. (If you’ve made these before, i’ll include the original recipe in the notes section so you can make just two again if you want. Combine all ingredients in a small bowl. Depending on how well you mash your sweet potato, you may have a few chunks. That’s fine. You could also put everything in a blender or food processor for a smoother batter. Grease waffle maker and cook 4 waffles. Top as desired and serve. For my sweet potato I just poke some holes in a large sweet potato, microwave 5 minutes, let cool and mash with a fork. You can eat them plain, but really…toppings are the best part so go crazy! I love making them into peanut butter sandwiches! they’d be great with squash! I need a waffle iron. Had oe years ago but gave it away when we moved onto the sailboat. Pinned! Mmmm! I love sweet potatoes – I just posted my own recipe for a sweet potato waffle yesterday. I’ve not used yogurt in any of my batters yet. Definitely going to try this one out! i think you both need to bring your waffles to my house so i can sample, mm k? Only if you bring the balls. i saw yours. they looked amazing! I haven’t had a waffle on quite some time. These make me want to change that! These would be epic with homemade apple butter and coffee! I love how versatile sweet potatoes are. These waffles look great! Love how you made waffle-wiches from them. That peanut butter….drool! eek! hope you find one! it’s always fun to change it up! Ooh my leftover sweet potatoes in the fridge would be perfect for this. Thanks for the recipe! What a great idea for leftover sweet poatotes! yep! perfect way to use them up! 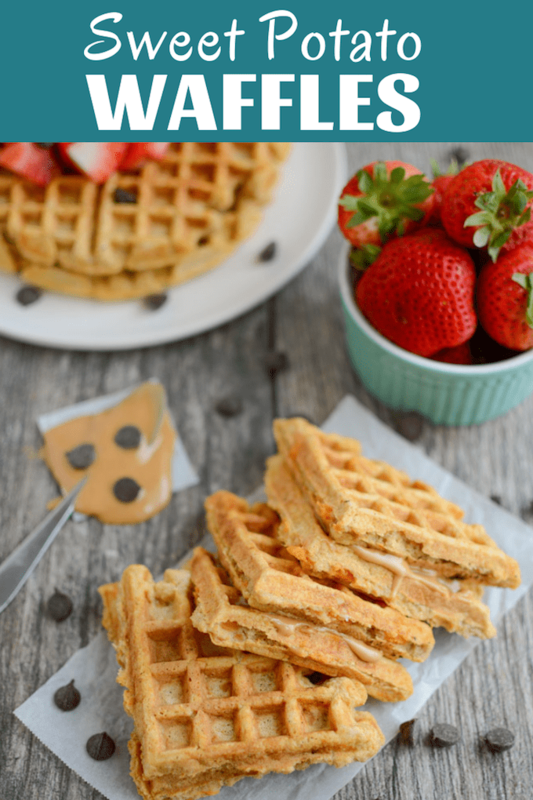 These are definitely happening this week…I have all the ingredients and a waffle sandwich is a MUST…Thanks for sharing! Such an inventive (and tasty) way to use sweet potatoes..pinning to make very soon! so at what point will you be available to come cook for me all the time?? I am the ultimate sweet potato lover, these look amazing! I really think I need to eat more waffles for a change. Thanks for the awesome recipe! you’re welcome! hope you enjoy them! Yum!!! I LOVE sweet potatoes and I love waffles, so why not combine the two? I bet these would be awesome with maple almond butter! This recipe sounds fantastic! I’ve never heard of such a thing! Yum. These would be a great pre run food! Adding them to the list! 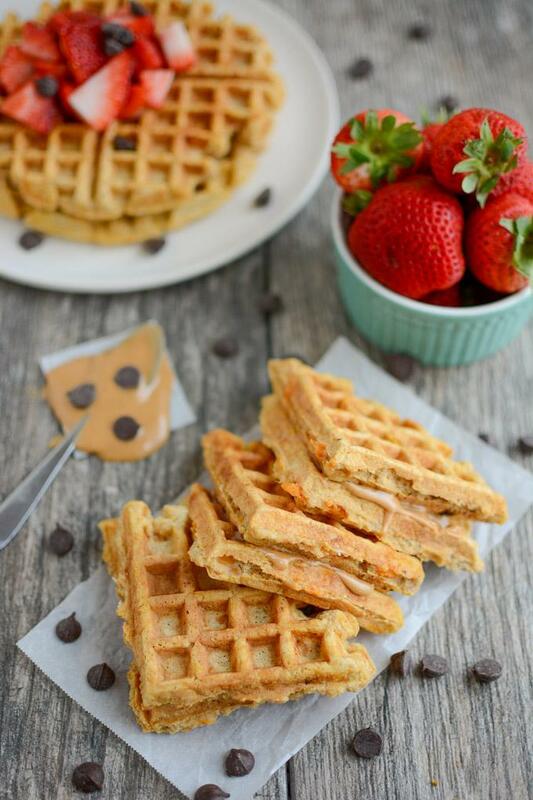 Wait… sweet potato waffles with peanut butter?? I need in my life ASAP. Pinned to prep this weekend… they may be my new afternoon snack! Oh wow, these waffles sound fantastic! I love the idea of making PB sandwiches. I’d totally do that! Um yum!! Yes to all of this! Ooh – look at that nutbutter peeking out! YUM! Love the idea of adding yogurt, I’ve been meaning to bust out the waffle maker now that the weather is a little cooler! I LOVE the way the sweet potatoes peak through on the insides of these waffles! So trying this! Thanks so much for this recipe, it looks delicious! Sweet potatoes are one of my favorite foods, but I’ve never used them in creative ways like this. I think I’ll make these and make an almond butter sandwich. Yum, YUM! I always put peanut butter on my waffles, keeps me fuller longer. However, I have never made homemade waffles, also need a waffle maker…we’re all on the hunt! I have two sweet potatoes in the fridge now, sounds like I have a perfect breakfast planned for the weekend! Thanks for sharing! YESS!!!!!!!!!!!!!! sweet potatoes and waffles are basically my two favorite things. makin’ these fasho. LOVE this recipe! delicious looking, wish I had a waffle maker… pinning anyway! Yum! These look right up my alley. I love the looks of the melty peanut butter sandwiched between them. I think Hunter would love them too! This is fantastic! 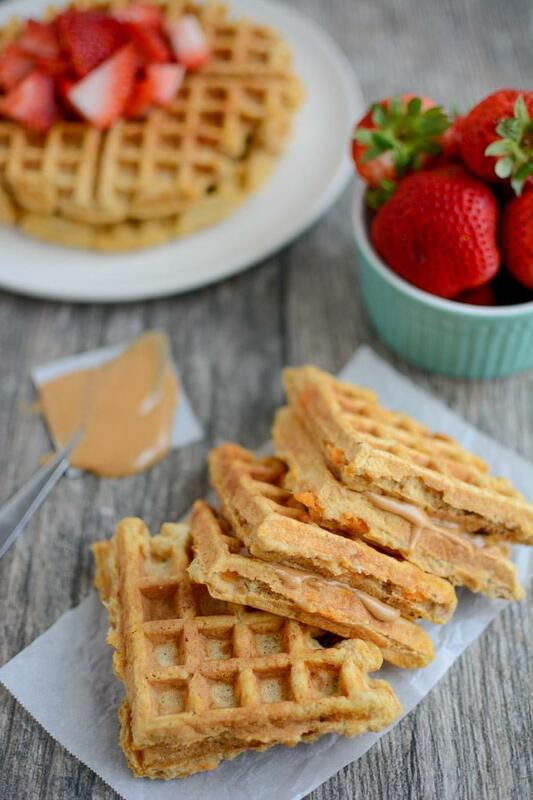 I really love the Sweet Potato waffles & PB sandwiches! Great snack for the kids! Thanks! Hope they’re a hit! Do you the nutritional breakdown? I don’t, but you could easily put the recipe into My Fitness Pal to find out! These were delicious! I absolutely love the idea of using them for peanut butter sandwiches. Just made pumpkin waffles – have to try sweet potato next time! Great idea! I always make such boring waffles. I really should make these. Even though I don’t have kids at home anymore, I’d be delighted with these as a weekend breakfast, or better yet – breakfast for dinner. i would think so. Haven’t tried these specifically but often freeze waffles (broken in half) and then just pop them in the toaster to reheat. Yum!! Waffles are always a hit with littles! My nephew could eat waffles for every meal! I just made these tonight. We were looking for a quick and easy dinner after a busy day out. I used the microwave like you suggested to cook the potato, so easy and mixed it all in the blender. I also used GF flour but a bit closer to 3/4 cup. Everyone in the family loved it and my youngest is requesting these for her birthday dinner (in September) . We had an omelette on the side so I also didn’t put the full cinnamon and vanilla amounts it. Yummy. [WORDPRESS HASHCASH] The comment’s server IP (173.236.168.102) doesn’t match the comment’s URL host IP (173.236.168.78) and so is spam.